Make a marination in a bowl. Put salt, brown sugar, black pepper, basil herbs, chicken powder and 2 tbsp water. Mix well. Put the chicken chunks into the marination and mix. Cover with cling film and refregirate it for about 15 minutes. Now take 3 plates. Spread corn flour in one plate. 2 beaten eggs in another plate and bread crumbs in the 3rd plate. 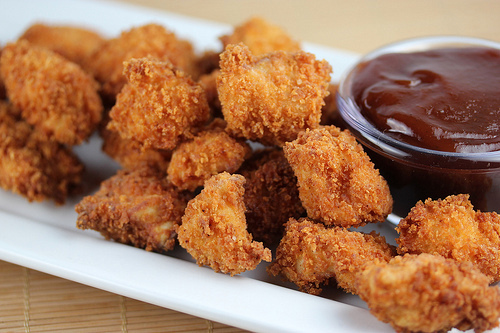 Take a chicken chunk coat with corn flour first then dip it in egg then coat in bread crumbs. Repeat the process for all chicken chunks. Now deep fry them until golden brown. Serve hot with any sauce.